The Women’s Engineering Society (WES) are running their third Lottie Tour in accordance with Tomorrow’s Engineers Week (5th-9th November). 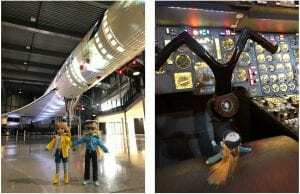 The tour is designed to highlight how varied and exciting a career in engineering can be and a huge number of engineering companies are supporting and taking part in #lottietour. 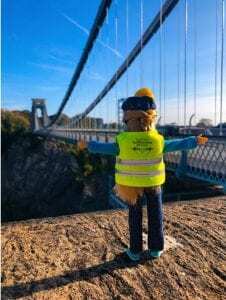 This year is the first year that Engineering at UWE have taken part and with the help of Laura Maybury, Rachel Szadziewska and our alumni, hopefully you will see for yourself that #lottieuwe dolls are having an excellent time! 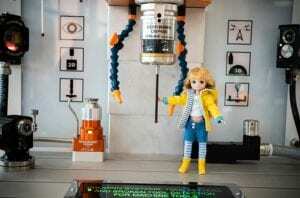 Lottie has been making a diary of her travels for the Engineering Our Future Blog…. I’m a little nervous this morning, it’s the start of my big tour and I don’t actually know where I am heading! Laura says that its one of the best places in Bristol, but that we have to leave early because we’ll probably get stuck in traffic. Well we’ve arrived (although I didn’t really appreciate being stuck in a handbag as we walked over from the car) and wow the view from up here is amazing. I’ve worked out that we are at the Clifton Suspension Bridge and I can see for miles. I went to see the bridge first to take some pictures and to learn a little about the bridge’s history. Work on the bridge began in 1754 and wasn’t completed until 1864. Unfortunately the bridge’s designer, Isambard Kingdom Brunel (IKB), would never see the completed bridge. Following an initial competition for the bridges design, and having found no one suitable, IKB at just 23 years old won the second competition. Major bridge investor Sir Abraham Elton called it ‘the ornament of Bristol and the wonder of the age’. Next, I was told that I was allowed in the vaults; I was a bit scared as we had to go underground, but it was definitely worth the visit. To save money, time and effort, the bridge was built into the cliff face rather than any of the cliff face being removed. They were only discovered in 2002 and were designed to support the tower’s weight and transfer load from the bridge into the rock face. We couldn’t go into one of the vaults as it was full of water and I didn’t want to get wet! I’ve had such a good first day; I can’t wait to see where I am going tomorrow…. 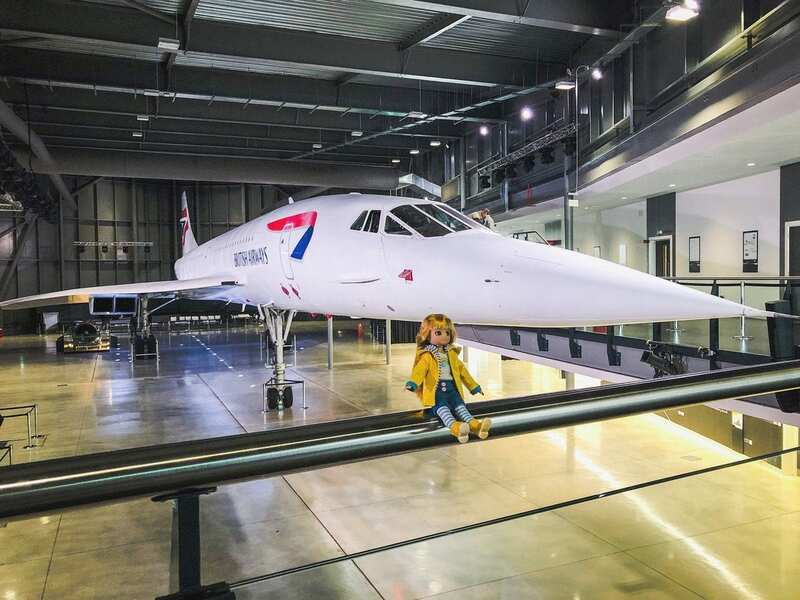 After yesterday I’m quite tired but I’m eager to get going as Laura has organised a trip to Aerospace Bristol….did you know they have a Concorde? Excited much!! Concorde is HUGE!!! It’s in a hangar on its own and me and my friend (she’s also called Lottie) were able to stand underneath her wings; we looked so tiny! I learnt quite a bit about Concorde and why she means so much to people in Bristol… I think I remembered everything. “Concorde is a symbol of the UK’s ambition, innovation, collaboration and technological achievement. Bristol can safely claim to be the true home of Concorde. The airframe and the engines were largely developed here, the UK assembly line was located here, and all UK Concordes made their maiden flight from Filton’s runway.” Concorde made her maiden flight on March 2nd 1969, but it wasn’t until October 1st of the same year that she achieved Mach 1. By November 4th 1970 she had clocked Mach 2. In 1977 she made the first of her famous flights between London and New York (previously bared from this route because of noise pollution. In 2003 she made her last flight. I can’t write anymore today as I’m about to be ‘posted’. I don’t know what that actually means but Laura seems a bit worried that I might get lost….I’d really rather not! I spent the day learning about Renishaw’s metrology products and how they help manufacturers to maximise their production output, significantly reduce the time taken to produce and inspect their components, and to keep their machines running reliably. I also got to speak to Kat about her journey into engineering; I’m glad I did as it’s really interesting. 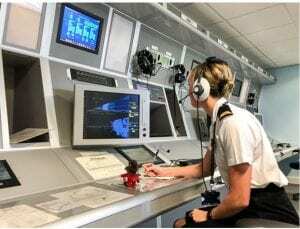 “My route into engineering wasn’t the ‘norm’ (but what these days is?!) – I started my Mechanical Engineering BEng in 2012 when my son started at pre-school. I did two years full time and then the sandwich year doing an Industrial Placement at Renishaw. I was asked to stay, so then finished my final year of studies split over two years part-time whilst continuing working. I graduated in 2017 with a First Class Honours. My role is a Design Development Engineer for the Styli Division – I get involved with the development of new products, changes to existing products, and anything quality related. A good way to describe my day-to-day is that I use all the different tools and systems on my computer to carry out investigations and problem solve. And I love it :)”. I’m back with Laura again today, she seems more excited than me about this one! 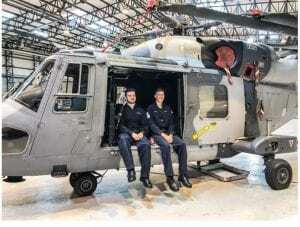 We are heading to RNAS Yeovilton although we don’t yet know what we are doing, we just have to ask for someone called Tracey Clempson who is going to show us around. I’ll write later when I’m back in the car! Blimey! I am completely exhausted! RNAS Yeovilton is vast (1,400 acres to be exact) and I’m pretty sure we saw nearly all of it. I’m only 17 cm tall….so this place seems like the biggest place on Earth and there is so much going on! I visited the Wildcat Helicopter Simulator before heading over to see 825 Naval Air Squadron (NAS) and the Wildcat HMA2’s they maintain. Then, on the way to visit 846 NAS and one of their Merlin Helicopters, I popped into the Stations Fire Department! As if that wasn’t enough, I finished my day in the Air Traffic Control Tower, visiting the controllers and the weather office! I could see the whole airfield from up there and a Wildcat was flying at the time. I still have one more day to go on my official tour but I’ve had such a great time that I have already built up a list of places to visit so you will definitely be seeing more of me! 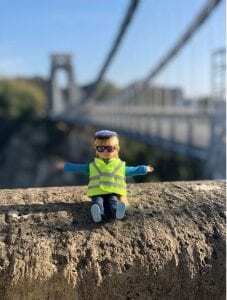 More of Lottie’s adventures can be seen on Engineering at UWE’s Twitter (@EngineeringUWE), Facebook (@EngineeringatUWE) and Instagram (@EngineeringatUWE) accounts and using #lottieuwe.